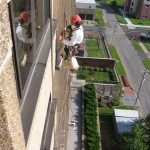 Vertical Access has assisted John P. Stopen Engineering Partnership with the hands-on investigation of several buildings on the campus of Syracuse University. 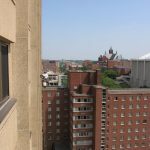 In 2007, VA performed the close visual examination of two residence halls: Lawrinson Hall and DellPlain Hall. 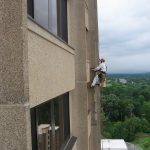 Lawrinson Hall is a concrete structure with pre-cast concrete spandrel panels and column covers. DellPlain is a curtain wall structure with enamel spandrel panels and limestone column covers. In 2011, VA performed the hands-on investigation of Booth Hall, a residence hall similar to DellPlain, and in 2012, VA surveyed and documented conditions at Haven Hall. All four structures were originally designed by King & King Architects in the 1960s. Hands-on investigation of existing conditions at all areas of building façades. Documentation of fault conditions to assist project team with development of repair specifications. Completed close-visual examination of building with minimal impact on building occupants and public. Took level and plumb measurements at cladding materials to assist in the investigation of the structures.